The efficient flow of air through an engine is instrumental for producing maximum power. To maximize performance, engine builders seek to understand how air flows through components and ultimately through the entire engine. Engine builders use this knowledge and apply specific practices and principles to unlock horsepower within an engine; this applies to all engine types, including V-8s, V-6s, and imported 4-cylinder engines. Former Hot Rod magazine editor and founder of Westech Performance Group John Baechtel explains airflow dynamics through an engine in layman's terms so you can easily absorb it and apply it. 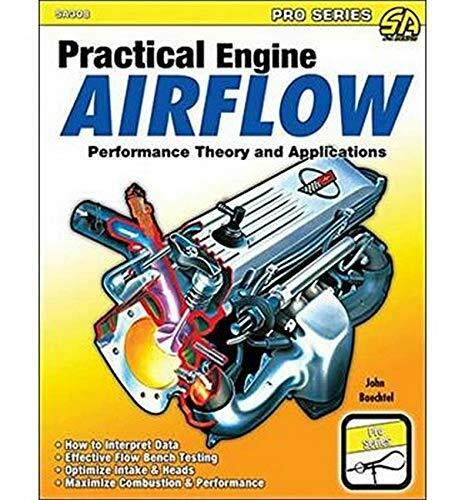 The principles of airflow are explained; specifically, the physics of air and how it flows through major engine components, including the intake, heads, cylinders, and exhaust system. The most efficient and least restricted path through an engine is the key to high performance. To get to this higher level, the author explains atmospheric pressure, air density, and brake specific fuel consumption so you understand the properties of fuel for tuning. Baechtel covers the primary factors for optimizing the airflow path. This includes the fundamentals of air motion, air velocity, and boundary layers; obstructions; and pressure changes. Flowing air through the heads and the combustion chamber is key and is comprehensively explained. Also comprehensively explored is the exhaust system's airflow, in particular primary tube size and length, collector function, and scavenging. Chapters also include flowbench testing, evaluating flow numbers, and using airflow software. In the simplest terms, an engine is an air pump. Whether you're a professional engine builder or a serious amateur engine builder, you must understand engine airflow dynamics and must apply these principles if you want to optimize performance. If you want to achieve ultimate engine performance, you need this book. To maximize performance, you need to maximize airflow through an engine. Avid enthusiasts and engine builders seek to understand how air flows through an engine and its components. They use this knowledge and apply specific practices to unlock horsepower from within an engine. And this applies to all engine types, including V-8s, V-6s, and import 4-cylinder engines. Former Hot Rod magazine editor and founder of Westech Performance Group John Baechtel clearly and succinctly explains airflow dynamics through an engine. The principles of airflow and flow dynamics through the intake, heads, block, exhaust system, and other components are revealed. Principles of air motion, air velocity, boundary layers, obstructions, and pressure changes are covered. Whether you’re a professional engine builder or a serious amateur engine builder, you must understand engine airflow dynamics and must apply these principles if you want to optimize performance. If you want to achieve ultimate engine performance, you need this book. John Baechtel is a former editor of Car Craft and Hot Rod magazines and was a founding partner of the Westech Performance Group engine dyno-testing facility. With more than 34 years of high-performance engine and vehicle testing under his belt, he is a veteran author of many books, including Performance Automotive Engine Math and Competition Engine Building.